I will talk about that, but first let me define it for you. There are times when Mother Nature creates extremely beautiful people and places, and hides them in a secure place, like a Momma Cat who stashes up ‘finds’ for later, and then forgets about it. Nongriat is one such gem in the ‘abode of clouds’- Meghalaya. It is in Sohra (Cherrapunji), close to a village called Tyrna. First things first. 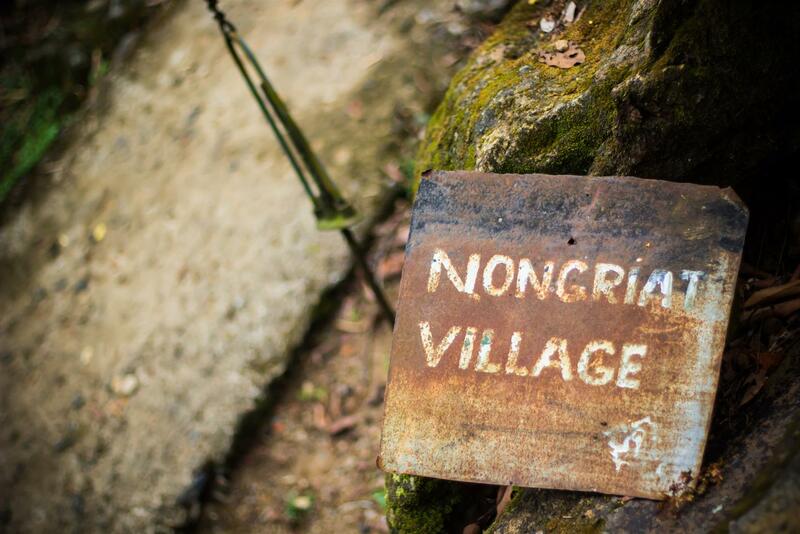 What are the number of steps in the Nongriat hike? The entire trail has 3500+ steps (or somewhere close to 3.5 kilometres) according to the local folks. 1. The leisurely staircase Effortless, scenic and beautiful. Down you go, almost running. The steps are made of concrete. 2. The steep, winding staircase These need caution and a certain level of fitness, because at some places, there is not enough space to wedge your entire foot. Couple that with slight algae-kind of formation on the stairs. Thankfully, this level of the trek has hand-rails alongside at most of the places. A small, beautiful patch on the way to Nongriat. 3. The bridges These need EXTREME caution if you are a non-trekker or/and have a fear of heights. There are a total of three bridges. One is made of bamboo, and the other two are made of iron. Nevertheless, both have loose-rods clustered together with wires, and the whole thing sways dangerously while one is walking on it. To be able to tread on these, you will need to have your hands free to hold the side wire-rope. Not only that, don’t let the gushing water-body underneath distract/scare you. Bridges on the way to Nongriat. I remember, just as I reached the middle of one of these seemingly never-ending bridges, it began to rain. Apart from worrying about my camera getting drenched, thoughts like ‘did I put the lens cap back on, or not?’ ‘Could the droplets be entering from the sides?’ ‘What if the camera DOES get soaked?’ started an emergency siren-of-sorts in my head. Just when I thought of stopping to check, the whole bridge started swaying like an off-centered pendulum, and I held on to it for dear life. I could not decide whether the bridge might snap undone because it could be weak, or would it do so because I carry ‘the weight of being a foodie’? Never again will I look at another Basil Pesto Pasta, dear God, please let me live this one time. One of the bridges to Nongriat, which is made of bamboo enmeshed with wires. Somewhere toward the end of stage 2, the path diverges. One goes to the single decker Living Root Bridge, and if you stay on the main trail, you reach the village of Nongriat. 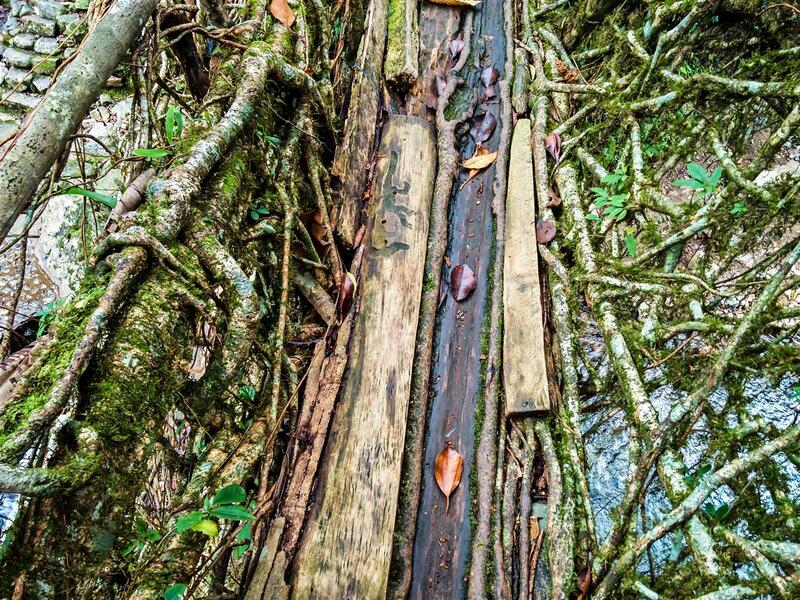 It is latter that has the double living root bridge, but even the single root living bridge has a fair number of visitors every day. The path is well-marked to inform you of places. Just after the last bridge is a ‘chai’-shop. That marks the end of the trek, and beginning of the village. 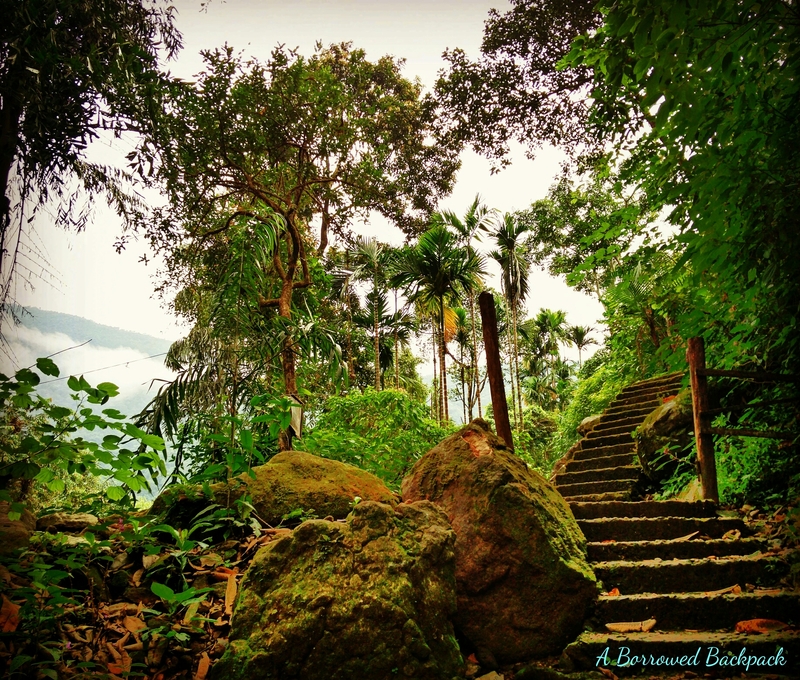 The beauty of the trail is, there is the fragrance of cinnamon and bay leaves all through. These are the two spices that grow in abundance here. Strange insects and animals provide a constant background-music and company. On one of the nights, I went to the bed with this sound (somewhere very close to my window), and woke up with it too. It created such a ‘hollowness’ in my auditory senses once it stopped, that it almost felt like my eardrums are missing a part of themselves. Since I just cannot sleep without fresh air, I kept the window open even when my mortal fear of waking up with a snake on top of me kept screaming itself hoarse. The insects, especially the butterflies are straight out of on-screen digital manipulation, or so it seems. Huge, colorful and wild; these things are simply surreal. Some of these are as big as your palm, or maybe even more. Take time to behold and enjoy the sight. Give that camera/phone a break and experience #unplugged life. Time taken: Nongriat can be pursued as a day-trek, as many tourists do. It ought to take you 2 hours (way down) + 2 hours (way up). You might have to factor in the fatigue-level depending on your physical fitness. Traveller-tip: In case you ask a local person as to how long a particular trek might take, and you don’t belong to the hills, just multiply the suggested duration by 1.5 times. For slow-travellers like me, it is advisable that you stay in the village. Absorb the nothingness and visual heaven at disposal. I stayed there for two nights, and still wish that I wasn’t so pressed for time. I can do ‘nothing’ like it is no one’s business. 2) The village guest house; managed by affable Challi and team. Both the home-stays are extremely basic fare. In case you are looking for luxury, consider taking a day-trek only. When I say basic, I mean just that. If lack of television, internet or/and gadgetry wonders perturb you, look elsewhere. I stayed at the village guesthouse. It does not have a fan, heater etc. The washrooms do not have taps. The water has to be filled in buckets, from the hand-pump outside and taken to the washroom. Alright, I’ll be honest; even the electricity is a guest here! Food: Food is simple and rustic. You might need to understand that it cannot be gourmet fare, given the circumstances. Three kilometers down into nothingness, life cannot be as fancy and random as one might be habitual of back home. One cannot suddenly demand ‘vada-pav’ or onion-bhajias. During my stay, breakfast options were porridge, egg, Maggi (noodles). Lunch was simple daal (lentil is referred to as that in India)-rice-vegetable fare and dinner was veg/non-veg curry and khasi style rice. If you ask me, I am happy anywhere if I get an unlimited supply of ‘chai’. These are natural wonders engineered by mankind and executed by Nature. A tree from the family called Ficus Elastica has its roots matted with pebbles, planks, logs, and is directed to grow horizontally towards the other bank. These bridges have been around for years and have stood the test of time (frequent rains and floods too), and embody the tribal spirit of resilience and resourcefulness. Beyond the village guest-house, across the stream is this region where the villagers have their agricultural land. There is forest and trails much beyond the area where the village-settlement lies. Why the Double Decker Bridge? Meghalaya is a land of heavy and frequent rainfall. For years, it was just the lower deck of the bridge, but it used to get submerged in the stream in case of heavy rainfall; thereby disrupting life. This is how the top deck came into existence. Nongriat is a small hamlet of the ‘khasi’ tribe. Khasis are extremely hard working folks, and have a matrilineal society. 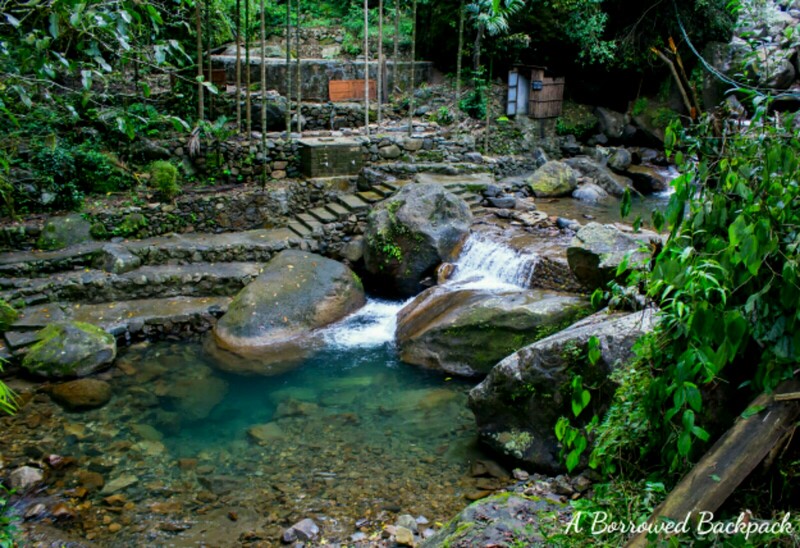 I have talked about this society in the post about Mawlynnong (the cleanest village in Asia). Nongriat cultivates honey (the one you buy from here would be the purest; the forest all around is completely organic) as one of the cash-yields. You can also buy cinnamon and bay-leaves from the village shops. Nongriat is uncharacteristically quiet. There are places so silent, that the noise of the thoughts in your head makes you restless; this is one of them. You have a limited view of the sky above, like a frog in the well. During the course of a single day, it alternates between being spotlessly blue, and having lowly hung rain-laden clouds. An umbrella of lush greenery, Nongriat is overwhelmingly dense, coupled with one of the best water bodies to spend one’s day in. The difficult bit is to get it to yourself, minus the Indian tourists (the college bunch, lechy men and families that think that waterfall is a part of their living-room). The onslaught of tourists slows down after 3:00pm approximately, which is when you are free to become a mermaid under the waterfall. For me, the hours spent in that natural pool were some of the best on the whole trip! It is only when the evening drizzle started that I rushed back to the guest-house, which was practically thirty steps away from the water-fall. The water at the fall is so clear that it is unbelievable! It is a well-maintained spot, with a changing room and a few dustbins here and there. The stream can be heard from the room, in the dead of the night. On my first night here, I requested Challi to put the cot out in the open. The star-studded sky and sleeping-out-in-the-open reminded me of my annual visits to our ancestral village during my childhood. Some time during the middle of the night, we (another girl from Bombay and I) felt that it was getting w-a-y too cold for us, despite our blankets. The top layer of the blanket was damp, probably from a drizzle or dew, not sure which of the two. We decided to head to our respective rooms for the rest of the night. Pack the following in your day-pack: mosquito-repellent, umbrella, rain-coat, pain-relief cream, snacks, water bottle, torch (flashlight, if you aren’t an Indian). Start the trek in the morning, latest by 8:00am. By the time the sun is overhead, you would have reached your destination. If you start late, like I did, not only do you get doubly exhausted due to the overhead-sun, you also have the mental stress of rushing back in case you are taking up a day-trek. In case you are looking for interesting places near Shillong, then Nongriat could be one of the options, provided you start early. There is no scope for trekking up or down once it is dark. Neither is it advisable. Keep warm clothes handy. When you begin the trek, you are on top of the valley, and hence the air is cooler and lighter. 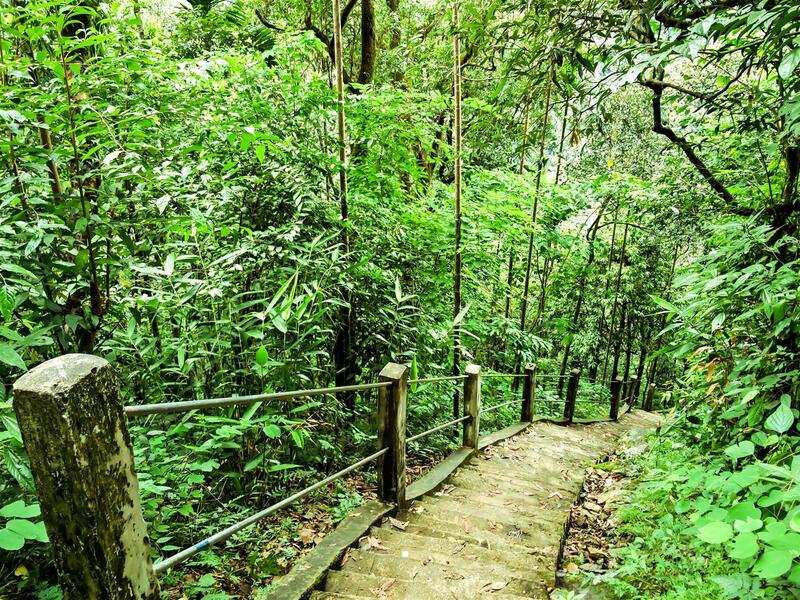 As you step down, closer to Nongriat: a) you start sweating because of continuous descent b) down into the valley, near the water-bodies, the air is sultry. You can smell the moisture and feel the heaviness in the breeze. And because of this, you sweat some more. Be VERY well equipped to face unplanned rain. It is Meghalaya; it rains almost without notice. More so, if you happen to be here because during the wetter months. If you do not have an umbrella and/or a rain-coat, you will not have any option but to get soaked. Cover your electronics carefully, preferably in water-proof bags, or polyethene. If you have a camera, lens, and other sensitive gadgets, store them with silica gel. You can buy Silica gel online here. Or this is another inexpensive option. Travel light. I had planned Meghalaya on my return journey from Bhutan, and my backpack was already weighing 22kgs with the entire world of ‘nothing’ that I had bought. Had it not been for Hebrit, owner of a backpacker’s hostel called By The Way, you wouldn’t have been reading this post. Not only did he offer to keep my luggage, he also laid out the whole plan for me, AND helped me regarding booking my stay at Nongriat. I travelled to the village with just the essentials in a day-pack. Carry a waste-pouch. Put all your wastages like wrappers, bottles, sanitary pads, condoms, etc in it and carry it back up with you, and bin it in the dust-bin that landmarks the beginning of the trek. In case you are wondering why I say so, the village has absolutely no system for waste-management. And it was horrifying to see our Indian tourists trek down with quintal of stuff to ‘make a picnic’, and then leave behind a mound of wrappers, aluminum foil, water-bottles, beer-cans, and liquor bottles. The waste that is left behind is simply burnt. There is no other way to deal with it, presently. Do not trek in slippers, sandals or anything which does not hold your feet snugly and covers it completely. Start the trek back up latest by 2:00pm. Sohra sees the early sunset as it follows bagan-timing. The image below was taken at 5:15pm. The prices of a few commercial things like biscuit, chips, water-bottles, noodles etc might be around 30% more as compared to the MRP. In case you belong to the lot that flares up at ‘injustice’ and ‘day-light robbery’, do them a favour; carry everything on your own from Shillong/Cherrapunji itself. While on a no-plan holiday, it is easy to forget which day of the week it is. Please don’t be like me; keep a track of the days. Do NOT make any plans for trekking back up without a transport on a Sunday. Sohra is completely shut on Sundays, and there is almost negligible chance of you being able to find a public/private transport back to anywhere. Two travellers from Mumbai understood my plight and I hitched hike with them to Cherrapunjee, which is approximately 17 kilometers away. The point where your vehicle will drop you, and from where the trek starts, is called Tyrna. The spoken language of the village is English, apart from the regional ‘khasi’ language. Please note: Almost no one understands Hindi here. Carry a few essentials like copy-pen, umbrella, shoes (if you can afford it happily), and gift to the village-folks. One of us, while trekking back up, had hired a porter to lug her stuff. Personally, I am strictly against porters lugging one’s stuff while on a trek, but this porter gave me another perspective. He charged Rs.300 for taking her things up to Tyrna. He told us that he often does this thrice-a-day!! With the earnings from lugging the baggage, he was funding his college education, and keeping alive the dream of being a footballer. Nongriat follows ‘bagan-timing’, which is almost an hour ahead of the mainland India. This is a photograph that I took at 4:30pm in Cherapunjee. Where To Stay In Nogriat? Serene Homestay (Byron’s guesthouse): Probably the only house in this village which has a fridge. Byron is a local go-to person of sorts for stays, food and everything in between. Even if you land up with both the guest-houses sold-out, this man will arrange something for you. Village Guest-house: Managed by affable Challi and his team. Four double-rooms. You pay on the per-person basis, instead of per-room basis. Traveller-tip: If you do not get through any of the phone-numbers, just take a chance and go. People with threadbare resources often have the kindest of hearts. Moreover, these folks are often too busy organizing things for people who are staying and hence miss calls. 1) If you are looking for off-beat places near Shillong, Nongriat fits the bill beautifully. Take a taxi from Bara-bazaar taxi stand in Shillong. The taxi will drop you off at Sohra. Fare: Rs.70. Also, ask the driver for the return-timing too. You can get a private taxi from Police Bazaar in Shillong. These taxis charge somewhere between Rs.1800-2500 for the day. [Please make a note: if you intend to take it as day-trek, make sure that the taxi driver is suitably fed to wait for you at Tyrna for 4+ hours. I bumped into a driver, who was hungry, angry and listless as the family he had driven to Tyrna, had set off on the trek saying “abhi aatey hain (we will be right back! )”. 2) If you are in Sohra, and want to experience things to do near Cherrapunjee/Sohra, Nongriat is where you go. You can follow (a) or (b) from Point no.1 for whichever way suits you. If ever you are left wondering what to do in Meghalaya, you know the answer now. Any of you who would like to gift a few pairs of shoes to the folks from the village? Most of these guys go up and down several times in a day in bathroom slippers. Any of you know someone who would? Or an organization that would like to take this up as a part of their CSR initiative? Write to me at aborrowedbackpack@gmail.com, in case you see yourself as an enabler of positive change. 1) I am on Instagram, finally! Say ‘Hola, girl!’ here, if you are on Insta too. 2) It all started with Alice at The Teacake Travels featuring a bunch of us here. 3) Then, Matador Network featured A Borrowed Backpack; here is the link. 4) And then Huffington Post (U.K.) followed suit, here. Thank you for all the love, folks! If you have adventure in your soul, and are looking for things to do near Shillong or Cherrapunji, this is it! nice post!!! 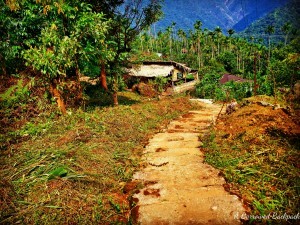 kinda reminded me of my own trek to nongriat! It was sad that i did not have the time to stay back at Nongriat and had to trek back up after just an hour s rest and a nice lunch of noodles at one of the homestays there!!!! did u by any chance make the trek to rainbow falls and onward to the base of nokhalikhai falls?! No, did not. Others who tried, lost their way and came back. It was raining off and on, so just took it easy. Was almost at the last leg of my Bhutan + Meghalaya trip by the time I reached Nongriat. oh! it was hot n dry when i was in sohra! this was both a boon and a bane! while the trek was a lot more easier, the pictures and the scenery were equally washed out in the glare!! thanks for making me jealous about it! it wasnt until the very last day that it actually rained there! i d stayed at ‘by the way’ too.. n heprit arranged bit (again, i dont know why the name s bit!) to ferry me to tyrna and back. Also, if it might help add info to ur post, aircel works at nongriat! airtel doesnt! Thank you. I think Airtel only has has hoardings all over Meghalaya; no signal. Hoardings that very bravely read “switch to Airtel now”. Same was the case with Mawlynnong. Only Aircel worked, everything else was on international roaming. hahah!!! airtel worked till by the way! n maybe little after that! beyond, i was out of reach! n thanks for correcting the spelling!!! 🙂 i think i still have the map he made out when i was there! haha!!! they were a nice bunch! and, incidentally the lady who ran the home stay also knew him! quite a well knit community, i guess! I’ve always had a thing for North East Travel. I’ve managed Assam & Nagaland but your post makes me want to plan a trip to Meghalaya soon 🙂 Happy Travels & Cheers from Wandering Passport! Do travel to Meghalaya, It is surreal. What a neat trek! I loved those simple bridges but my favorite is the long exposure waterfall photo! Simply stunning! Did you trek by yourself? Yes I trekked totally on my own. Oh wow that’s so cool! Well done! Looks lovely, but I read the entire post and have no idea what country or even part of the world this is located in. Will check and edit. This is north-east of India. Those are amazing photos. I don’t think I have ever heard of this place. Yes, travelling with kids calls for caution, and I would not recommend this to anyone who is skeptical about anything, which is why I have put the whole thing in a way that it does not misinforms. This looks amazing! 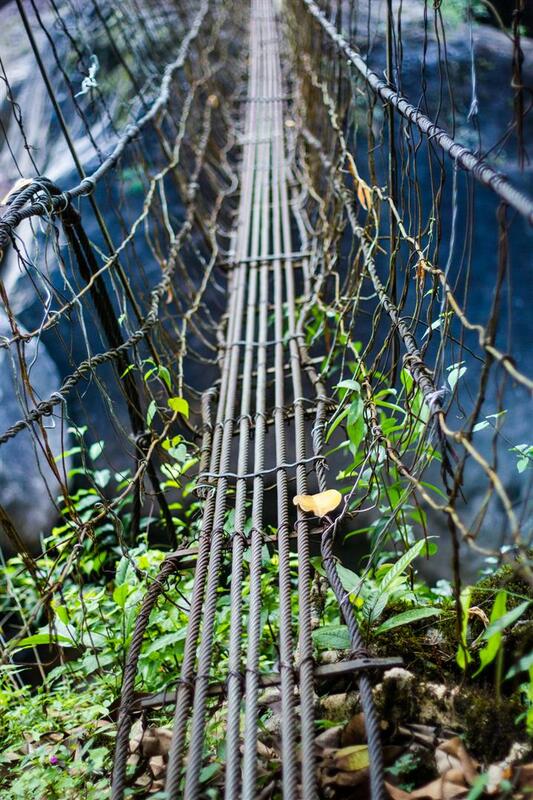 I would love to do something like this, although I would be very scared on those bridges! That’s true! This is some thing that can figure out up ahead in the timeline of life. 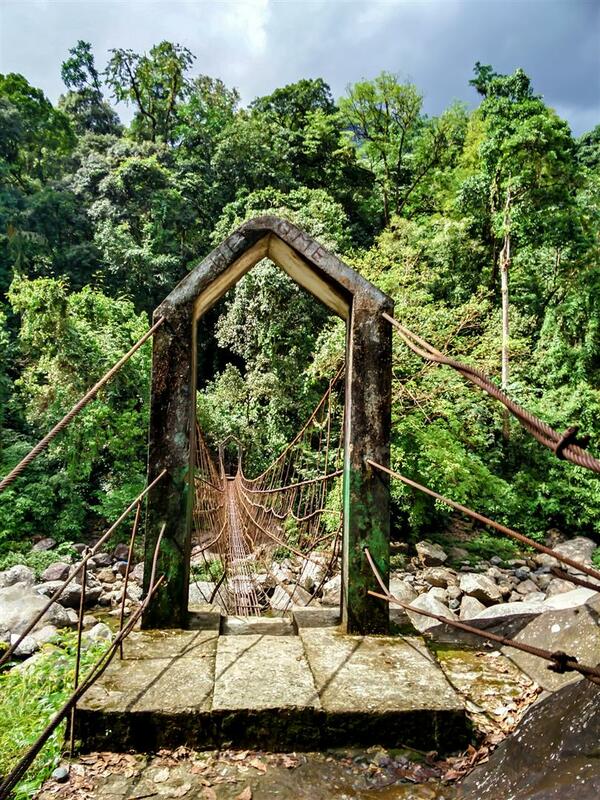 Meghalaya is pure poetry and your pictures and words do ample justice to that. Have not been to Meghalaya, only been to Sikkim in the North East. The entire region is full of untouched gems like Nongriat. Thank you for the kind words. Haven’t been to the entire region yet; it is on my list. This looks like a very fun an adventurous thing to do, although a little bit scary. I am always up for a new experience and trying out something that is out of my comfort zone. The pictures are great. Yes, it is slightly off-beat for trvael, I agree. I love hiking and being close to nature so walking this trail i definitely something I would like to do. What a bridges! O.M.G., it must my awesome experience to walk on it! Hi Epepa, awesome and thrilling, both. OMG!!! My boyfriend and I are traveling to India this July! Nongriat! We’re going there! Thank you for this! Have a safe and happy trip. Do feel free to ask in case you need to clarify anything. I would love to take this trip! I’m not scared of heights, so I would have no problem with the bridge. And the smell of cinnamon sounds heavenly! Those bridges look like something I would really want to try and will do it but while I am crying my fears out. The two paths, although both different, looks beautiful. As for the basic stay, I am okay with basic but this kind of basic might be too much for me .. No fan .. I don’t like the heat! What I found most interesting though is the double bridge. At least now they have two bridge when it’s not flooded! I will not try to soften the fact that it calls for decent bit of adventure in the soul to take up this trek. You’ve taken some really incredible pictures and it feels like you’re really there! Also I think that your post has provided some great information – this is the sort of thing that often gets overlooked by guide books. Also, did you really mean when you said ‘ Did not alleviate the anxiety…’; I am hoping the post has helped you. Be careful, the rains are heavy during this time. 1) Did you fly into Shillong? If so, did you get a taxi from the airport to the bus stop to take you to Cherrapunjee? 2) Even if you didn’t fly into Shillong, do you think it is a good idea to stay in Shillong/Cherrapunjee for a day before going to Nongriat? I want to spend one day in Nongriat overnight to break up the trip. 3) How did you book the taxi for the return trip if you spent the night in Nongriat? Or is there some sort of public transportation? 1) I took a train to Guwahati. Went from Guwahati to Shillong by road (shared taxi). 2) It is a great idea to spend a day in Shillong/Cherrapunjee. I spent a day each at both the places. 3) I hitched-hike back to Cherrapunjee with some other travellers. There is a bus that goes from Tyrna to Cherrapunjee once a day, and you will have to figure out about its timings from the local folks. Hi, when do u think is the perfect time to visit? what is the suitable time to trek mam? Preferably not so rainy months. Yes, Wirra. Oct is good. I too had done it in Oct only. How many days you want to stay is the question. The answer is pretty lucid. Also, many tourists (foreigners or locals) can stay as long as they wish, what is the point of reference? I did not get. OMG! Thank you so much. That was all the information that I was looking for. Thanks a lot for such details. Thanks for the post. Thinking of heading there in March. Do you know if foreigners need a permit? I don’t think that a foreigner needs a permit. Thank you, Divya for such a resourceful write-up! We’re tour planners and have been exploring about off-beat locations recently. We’ve been researching about Tyrna since the last few weeks and this is the best piece that sums it all for a traveler to prep-up! How many days will it take for a backpacker to explore entire Tyrna sights including Sohra? Thanks again! Isn’t this something which based on one’s luxury of time, stamina and money? People do it in a day too, while a bunch of girls I bumped into explored the area in four days. Could you tell me whether should I go to Rainbow falls by staying over at nongriat or just do a day trek to Double Decker falls? Staying over is a better plan any day! Just read your complete blog and i must say …it is very helpful. The owner, Hebrit, does not take calls or answer emails. I had had a detailed conversation about this with him. He manages something or the other for whoever shows up. It is there when you enter Cherrapunji, a road bifurcates towards NIT. It is at that junction. Thank You Divya…actually we are group of 5 adults and 01 Kid about 6 years old. We have been trying to get in touch with Byron on his two mobile numbers but it is continuously switched off , I have even send him a mail. Do you have any other way by which I can contact them or the contact details of the other Guy. It was real fun to read your blog. I can imagine and experience the surreal beauty of nature while reading your blog. I am visiting Meghalaya for my honeymoon in the month of June(end)-July. Nongriat stay is part of my itinerary. I tried reaching “Byron’s guesthouse” & “Village Guest house” but could connect. Can you please suggest any other way to make the reservation. Lastly, any other suggestion/advice will be highly appreciated and helpful. That’s the only way I know. Or, just take that risk and go irrespective. Thanks for the details. I just started searching places for north east trip from Delhi and this is a must now for me :). This is so so informative and lovely tips. -> Do we need to walk down from Tyrna to Nongrihat? -> Is it OK with kids (infants – 6 months and 1.5 years)? Four of us, three adults and a 13 year old are visiting end of December. We just wanted to do two places during the 20th afternoon until 26th Afternoon trip to Meghalaya. After reading your blog, trekking and doing nothing, watching the skies, walking around, experiencing the Khasi and other cultures there is the plan. We land in Guwahati and plan to take a private car from and to the airport. What is a good plan if we want to visit Nongrihat, rainbow falls, Dawki and maybe one other place or not, if they are too far apart. Shillong? We could do 2-3 nights in one place. Please suggest. Thanks for taking the time. Please consult a trip planner; I only write about my experience.